The street rod market has for many years been considered to comprise cars built before 1949 – around the time that hot rods were initially created by soldiers returning from World War II. As many of you know the story, a handful of these war heroes took the innovation they applied in the Armed Services and branched out into automobiles, racing homebuilt contraptions and jalopies on the dry lakebeds and salt flats in the west. Today, the street rod market is made up of several smaller markets that include traditional hot rods (pre-’49), shoebox Fords (the 1950s), muscle cars (’60s-early ’70s) and modern muscle (current crop of OEM performance vehicles). 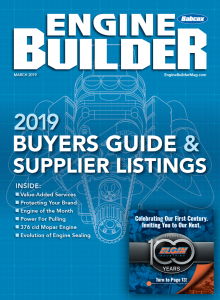 Defining this particular market “is like trying to nail Jell-O to a wall,” according to Engine Builder contributor John Carollo. The market for engines in these vehicles is also just as described above. But one thing that sets all of these vehicles apart is a custom engine instead of a boring crate motor, because no one wants to see a small block Chevy under the hood of another ’32 Deuce Coupe. If only the Beach Boys had written a song about it… But back to the topic at hand. By and large, hot rodders in the past decade or two have relied on crate motors for their builds because these mills are cheap and easy to add chrome, gas and go. But this is to the detriment of engine shops that specialize in custom one-off builds. Carollo says that there are not as many street rods being built these days as there were in the past. And more builders want subcomponents that are bolt-on ready, meaning that rear ends, engines, transmissions, suspension and brakes should all be ready to go out-of-the-box. One of the street rod segments that is still trending is the retro hot rod market (aka Rat Rods). Carollo says this is due in part because younger guys don’t have the money to build higher end cars, and many older project vehicles are hitting the market in the $3,000-$5,000 range. It used to be you could buy an old project vehicle for $500, but those days are long gone. Now, Carollo says guys are spending $4,000-$5,000 or more for a project vehicle in good enough condition to restore. According to one prominent parts manufacturer, people are focusing more on performance than looks these days, which makes it an excellent time to be on this side of the industry. He explained that people used to spend most of the cash on paint and wheels. But they are seeing more and more Rat Rods being built that focus more on functionality and performance. Ultimately the performance push will drive enthusiasts to an engine builder’s shop. Some guys can do the assembly work and hire out the rest, while others want a more turnkey approach, especially with engines. Engine builders should be able to help all sorts of customers whether they are looking to save a buck and want to do the assembly and install or you are taking on the whole project (engine and install). Looking at the overall market for the hot rod industry, according to the Hot Rod Industry Alliance (HRIA), which is part of SEMA, the industry is a healthy $1.26 billion with a “B” strong. The majority of the market (46%) resides in the western half of the country but there’s a healthy part in most areas, you have to make an effort to go out to the car shows and work with local hot rod builders. The survey also reveals that the vast majority of products purchased in 2017 were for engine and engine related (exhaust, fuel, intake) components. NSRA describes a street rod as a means of self-expression for the builder. A street rod can be whatever the builder wants it to be, as long as the vehicle was manufactured before 1949. Builders often add a more current model engine and drivetrain (i.e., from a small block Chevy to anything and everything in between) from any car. While purists say these cars must be pre-’49 vintage cars and trucks, the evolution of the market has led to many referring to any modified street car as a street rod no matter its original vintage. A lot of purist hot rod builders (and customers) go with “period correct” technology, meaning carbureted engines, but many others embrace new technology (e.g., fuel injection) for the reliability and cold weather driveability. It is more complicated to build more modern stuff and also more expensive – but it depends on what your customer wants. Of course, the revered muscle car is well represented in the street rod/performance hot rod market, but they may be starting to taper a bit as the baby boomers have already acquired so many of these vehicles for their collections. One thing that Carollo and others point out is that baby boomers seem to be starting to get rid of their projects and flooding the market with cheap, nearly built or 90 percent of the components to build one as a package so they can move on to another project or downsize altogether. Not only are they getting rid of some muscle cars, but also old Model A’s and Dueces are available that may have been locked up in a garage for decades. Are we out of barn finds yet? Probably not. It looks like there may be a fresh wave coming through soon, and savvy builders are ready to jump on them. These vehicles may have been built or restored once but now it’s in need of a freshen up. They may not look too bad to the naked eye, but once you start going through them, there’s much work to be done, especially if you plan to add modern vehicle technology such as EFI or power adders. In the previous decade or so, the baby boomers who were active hot rodders were also more mechanically inclined. They worked on their cars and subbed out parts of their builds to other specialists. Today, many baby boomers are getting long in the tooth and short on mechanical motivation. Those who are still hot rodding have either already built the car of their dreams or are willing to pay someone to do it for them. The younger generations are much more DIFM (do it for me) oriented as we are moving further away from working on our daily driven cars that are computer controlled from top to bottom. But don’t let technology turn you away from the classics. There are still plenty of Ford flathead engines and parts, as well as vintage Cadillac engines to be built by an expert shop. You can also find many vintage parts to fit that Oldsmobile Rocket, Chevy 235 straight six, Ford Y-blocks and Buick Nailheads and many other vintage engines that may be lost in time but need a new life breathed into them. Typically a cast piston is suitable for most street rod builds that are more for cruising and idling in parking lots than for racing use. Once you get into the higher end of the horsepower spectrum, you’ll need to go with a more durable combination. An example of what upgrades may include are balancing the rotating assembly, blueprinting the block and heads, installing a stroker kit to increase the engine’s displacement and power, or doing some mild performance work on the heads and valvetrain. A good street rod engine should have good drivability and power, but doesn’t need to be overbuilt. As Crocodile Dundee said, that’s not a knife! We felt the same way looking at the V12 LS in front of us. We recently caught up with a couple of hot rodders, Matt Corish and Craig Ruth, just before they headed to SEMA with a one-of-a-kind custom V12 LS Cheetah Evolution. 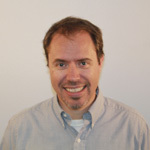 Corish is an Aussie who spends quite a bit of his time in the States these days as the co-founder of V12LS.com. The “dot com” part is more for marketing but his creation – a fire-breathing 1,000 hp V12 – is virtually one and a half LS V8 engines molded together. Craig Ruth is the owner of Cheetah Evolution/Ruth Restoration in Grafton, OH. As we pulled up to the shop, the engine was idling, and Ruth was at the controls of the monster V12 LS. Corish was on his laptop to do the break-in procedure to make sure everything was running as it should before packing up for the cross-country trip to SEMA. Corish said that this was the first V12 LS with an automatic that they’d ever done. It was mated to a 200R4 transmission with billet internals to handle the modestly tuned engine that was rated around 800 hp on pump gas. Ruth said it was a tight squeeze into the little Cheetah frame with minor modifications, but it took him half the morning to mount an oil sending unit. The engine is about 8.8 inches longer than V8 LS except with four extra cylinders! (To read more about the V12 LS engine and how it was made, check out our Engine Block story on page 12 and the V12 LS sidebar on page 18 of this issue). Most of Ruth’s bread and butter customers are Corvette owners from all over the region. 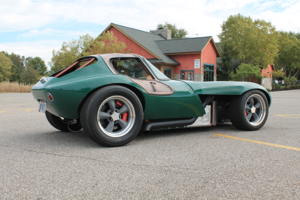 He’s known for building and maintaining Corvettes but has also delved into car manufacturer status with the Cheetah Evolution, which is a fiberglass body on frame retro sportscar modeled after the original Cheetah from the 1960s built by Bill Thomas. Ruth says that all of his cars have a VIN registered to Cheetah Evolution, so it’s not a kit car. Besides, most of the people who could afford one (six-figures-plus), probably won’t be able to build it themselves anyway. Ruth has already built about seven or eight Cheetah’s for customers since incorporating in 2007. The builds are a months if not years-long process because much of it is made in-house from the frames to the bodies and all of the fab work. The V12 LS Cheetah will be for sale after SEMA, according to Ruth. But we think they won’t have a problem finding a buyer since it turned out so well and received a Motor Master’s Award from JE Pistons at the show for the best domestic engine. Congrats to the boys at both V12 LS and Cheetah Evolution from bringing everything together in such a short time. Ruth said because of the transmission they couldn’t run a Throttle-By-Wire setup, which he says saves space and fabrication time.